Busan, South Korea – Home to 3.5 million inhabitants, Busan is the second most populous city in South Korea and extends along the south-eastern coast of the peninsula. Studio Migliore+Servetto, which has been active in Japan and Korea for a long time, is currently working on a redevelopment project here that spans an area of 5 kilometres of disused railway overlooking the sea, which will give rise to a themed park called the “Blue Line Park”. For the design of this vast area - construction of which will begin in 2019 - the architects worked on different narrative levels in order to provide a new waterfront for the city, and at the same time offer visitors a diverse range of activities that will engage users of different ages and interests. In Migliore+Servetto's layout, the theme of re-appraising disused spaces is interwoven with that of landscape architecture. On the one hand, the designers took the historical transformations and the local context and territory into account and decided to maintain a link with the long-established character of the area. 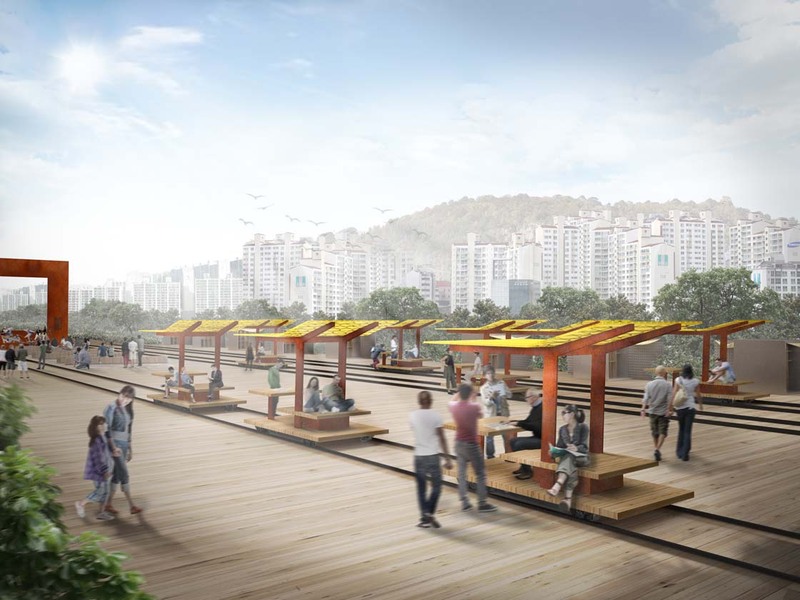 On the other hand, their aim was also to rebuild the relationship between humans and nature, transforming the area into a sort of filter between the bay of Busan and the surrounding urban fabric. “Blue Line Park” is the place where the city is reconciled with the natural landscape, thanks in part to a targeted use of technology and sound design, as well as a new and fascinating cultural hub for events, concerts and collective activities. The project is part of a strategic territorial action that aims to establish Busan as a meeting point between past and future. It is true that, following Seoul, the face of the future here seems to coincide with a cutting edge vision of the city. It is important to remember that Busan is a rare stretch of South Korea that was not affected during the Korean war. As a result, since it was not subject to bombing and destruction, it underwent a less organised transformation than Seoul, and for this reason it is still possible to sample real Korean tradition among the alleys of certain districts, such as in the Chungsapo area, which houses a small port of artisans and fishermen. The linear park designed by Migliore+Servetto unfurls over five kilometres and feature two main entrances, with two new urban squares that serve as a junction with the city. On one side, the narrow side streets of the district, densely packed with artisanal businesses, flow into Mipo Square, while on the other side, the multifunctional space emerges near the old terminal of Songjeong railway station.